When you have decided that it’s time to make an investment in a quality gutter system for your home, one that protects the most valuable asset that you own, please consider making that purchase from the professionals at Austin Gutterman. 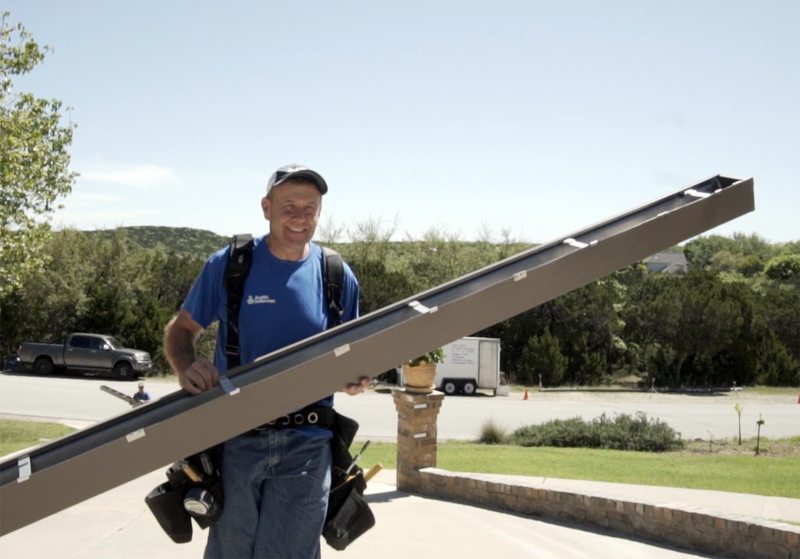 When it comes to the seamless gutters Austin homes deserve, Austin Gutterman uses the Leaflock system – the only leaf guard protection system guaranteed for the life of your home. With an investment that lasts a lifetime, you certainly want to make sure that you are making the right choice for your home. The seamless gutters Austin Gutterman will use on your home are from Leaf Lock, a gutter protection system engineered so that you won’t ever have to clean out your gutters again. The LeafLock system creates a barrier where leaves and other debris will flow over the top of your gutter and fall to the ground, while the rainwater flows from the roof directly into the gutter and out your downspouts for proper drainage. The system works with seamless gutters and can be attached to any kind of roof. With a lack of debris weighing down and clogging your gutters over their lifetime, the LeafLock system guarantees to keep your gutters strong and free-flowing for the life of your home. Enjoy the decades of peace of mind that come with purchasing a set of the seamless gutters Austin Gutterman can provide. Let our gutter installation professionals provide you with a free estimate and answer any questions that you may have about our products and services. Schedule a proposal today at our website www.austingutterman.com, or call us during our business hours at 512-450-1821. Austin Gutterman is open five days a week, Monday thru Friday from 7 am to 5 pm. We look forward to hearing from you and are excited about the opportunity to help protect your home.